It’s been very busy lately. It seems management is relentless on it’s perceived mission to ignore the contract more than ever before. New supervisors tend to make new supervisor mistakes, but some of the actions taken by more seasoned management lately leaves one to wonder if the increase isn’t coming from the District or Area. The President and Vice-President cannot be every member’s personal steward, so please understand if we refer you to your Steward or Chief Steward. By the Stewards and Chief Stewards fielding the questions and grievances, we are all able to get more accomplished and believe me, the Stewards and Chief Stewards are more than capable. When an issue or question arises that the stewards or Chief Stewards don’t have the answer to, they can inquire with the President and Vice-President and by this process, we all learn, and the next time the same or similar issue arises, the knowledge gained by the stewards will benefit others. Certain things we know are coming from the higher ups. Limitations on changes of schedules and non-sched day overtime limits are of frequent discussion amongst the craft. This too shall pass. We had a great turnout today at the Union Office where we gave 8 members Steward Training. Some were nominated/elected at the January meeting, and some were members that just recently decided to get the training with the possibility of being appointed stewards and alternate stewards soon. The enthusiasm expressed by some of them was really uplifting and makes me feel good about the future of our local. The future looks very promising. Thursday night is a Union Meeting, and will be the last one that our current President, Jim Bertolone, will be leading. I hope many will be able to find the time to come out and wish Jim the best in his retirement, which will begin in just over 2 weeks. I realize it has been a bit of time since the website has been updated, and I apologize for that. If any member wishes to contribute content to the website, please drop me an email at Rob@apwulocal215.com , I would be eager to accept the help. All, At this point in time we are examining the new Trump Executive Order regarding a Federal hiring freeze and investigating whether it applies to the Postal Service. We are in discussions with our attorneys, our sister postal unions as well as postal management. When we have a clear answer we will get back to everyone. Thanks for your patience. The Following is a list of the nominations that were presented at the January Meeting. All nominations were unopposed. Therefore all nominees will assume Office on April 1st. Those offices listed below as “vacant” had no nominations. If you are a full dues paying member in good standing, and have not been an EAS employee, or 204b in the last year, you are welcome to submit a request, in writing, and will be considered by the President after April 1st. Anyone wishing to be an alternate steward needs to put the request in writing and send to APWU Local 215, PO BOX 22692, Rochester NY 14692. The President will consider all requests and appoint alternate stewards at the April Meeting upon Needs of the Sections and Approval of the Executive Board. 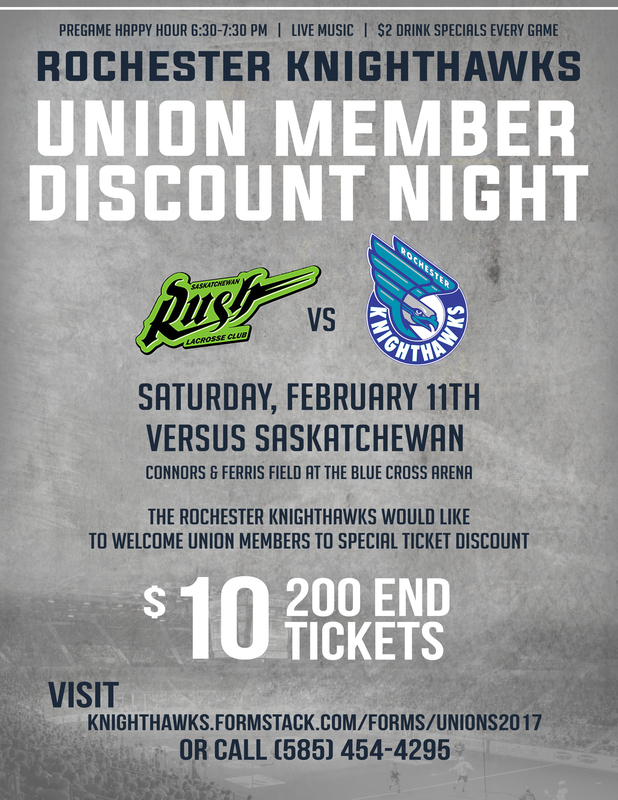 There is a Union Member discount available for a Knighthawks Game on February 11, 2017. You can click knighthawks.formstack.com/forms/unions2017 to get discounted tickets. LMOUs Are Finished And Online !!! Every LMOU that was updated and signed is now on the website. This includes LMOUs that cover Maintenance, Motor Vehicle Service and each and every associate office under our Local. You can find them all and download them by clicking on LMOUs at the top of this page. Only the Clerk LMOU in the P&DC and the Clerk LMOU in the NW P&DC were not updated. No agreement has been reached because Management hasn’t decided whether it wants to sign the agreed upon language or not. Our 2010-2015 LMOU stays in effect, at least for now, so I have placed them on the LMOU page as well. Feel free to print copies for yourself and coworkers. There is a very important Union Meeting this Thursday, January 19th, because this is the meeting for nominations for your representatives that will start a new term of Office on April 1st. President Jim Bertolone will not be seeking re-election, so all offices are up for grabs. Members desiring to be a steward or other officer should show up at this meeting. Bring a union brother or sister!!! Posted in Uncategorized	| Comments Off on LMOUs Are Finished And Online !!! As a reminder, our next union meeting is at 6 PM on January 19. All of our offices should find a notice on their union bulletin boards that this meeting is the meeting for nominations for anyone wishing to be anything from steward up to local President. Come to the meeting and run for office, nominate someone for office, or support those willing to run and represent you. See you there! Posted in Uncategorized	| Comments Off on We won!!!! Apparently not all of the money from the Associate Office Infrastructure Award, that ET-10’s and AMT’s received about $1000 for in Early 2015, was dispersed. Well now most of that leftover money is coming direct to the same people that received the original award. I don’t know all the particulars, but if you are an ET or AMT that received the original $1000 in 2015, then you probably received a check, or will soon, for around $107 in the mail. Apparently if there is any left in 3 years, it will also be dispersed to the same people at that time. Hope this explains to all receiving those checks but don’t understand why. Look for more of an explanation on the National Website, hopefully, in the near future. Global Remedy Settlement has not been paid yet and is forthcoming. There were 13,393 payees identified on the first round of payments. the errors from the initial payments. APWU requested that the payouts be inputted by APWU bargaining unit employees and that the payments be made on separate checks for tracking purposes. Instead the USPS inputted the payments by Labor Relations staff via pay adjustments on normal payroll checks with the end result being thousands of errors. APWU has now been tasked with comparing the payments made by the USPS in the initial round of payments with the individual amounts the APWU submitted for payment, consistent with the amounts placed on the APWU website for the payees to review. During this timeframe, APWU received a list of 94 payees that were either not on the original list for payment and/or not credited for the proper number of weeks. Payees Not Paid: 44, of which the Postal Service has corrected all but 6. At the August 2016 National Convention, the APWU delegates voted on and passed a resolution requiring the APWU to support requiring the USPS allow the APWU Support Service bargaining unit make the payment adjustments for the second round of payments. The Clerk Division supported the Support Service Division on this endeavor. After months of discussions, the Postal Service would not adhere. On Monday, the Postal Service informed me that Eagan would be involved in the payment processing. 2. Additional payment of $26.23 per week for those incorrectly credited/ or not credited at all in the first round of payments ( based on forms submitted to the NBA), to be include in the payment. The Postal Service stated they will be subtracting from the second round of payments to payees any amount that was overpaid from the initial round of payments. The second round payout information will be placed on the APWU website under the Members Only section for the payees to review in the same manner as they did in the first round. This is the correct amount due the payee. Any overpayments from first round will be subtracted from this round resulting in a few receiving no second round payment. We will also keep the initial payment amount on the website so that a payee can ascertain what they should have been paid on the first round also. The process has been tedious as employees have retired, changed their names due to marriage/ divorce, change back to maiden name, etc. We will send a spreadsheet to the NBAs, Regional Coordinators and the State and Local Presidents to respond to inquiries. Under the first payout I had to research individually over 600 inquiries on non-payments only to find only 44 actual errors of non-payments., roughly 7%. If an active employee states they have not been paid, I will need all pay stubs dating back to January 2016, no exceptions. When I requested the pay stubs previously, in almost all cases in the past, it was determined they had been paid. If the payee is retired, I will need the Postmaster’s name, office name, office telephone number of the post office and ONLY after the APWU local/state president has contacted the Postmaster and verified they did not receive a check for the payee. I will be working with APWU Retirees Director, Nancy Olumekor. Inquiries can also be made to USPS HQ Finance Department to locate where a retired payee’s check was mailed to and if not located, the process for reissuing a new check. Normally these checks are mailed to the last office of employment with the Postal Service. As this second and final payment will distribute any and all remaining funds from the $56,000,000.00 payout, it was extremely important to exercise care in getting this right. I would like to personally thank Mike Barrett of the Buffalo Area Local, Geoff Knowles and Roger Cronk for their much valued assistance in bringing this task to closure. I am confident that we got it right. As a result of the numerous errors made on the initial round of payments, the USPS has informed me that there will be numerous layers of vetting the payment process for accuracy on their part as the OIG was involved. Do not expect to receive the payments during the holiday season. I will share more information on when the payments will be made once the information is provided from the Postal Service. The goal is to have the payout information on the APWU website under the Members Only section and distributed to the field no later than Friday, December 9th. Please share with your APWU local/state presidents, officers, stewards and members. PSE’s entitled to (3) shirts. The new contract includes a provision that entitles certain PSE clerks working the window to have three shirts purchased for them. 1.) Those working the window at least 4 hours a day for 5 days a week. 2.) Those working the window more than 30 hours a week. Posted in Uncategorized	| Comments Off on PSE’s entitled to (3) shirts. Staples News – Be concerned, be informed!!!!!! The National Labor Relations Board ruled in favor of the APWU and declared the Staples deal violated Federal Law. After reading the NLRB’s report, I find it reads like a conspiracy novel. We should all be very disturbed at the shady deal making that occurred to try and eliminate Clerks, and reduce the clerk hours and office hours of Post Offices. Take the time to read the whole decision. You can download it at the National Website at http://www.apwu.org/news/web-news-article/stinging-rebuke-nlrb-rules-usps-staples-deal-violated-federal-law . Posted in Clerks, NLRB, The Website	| Comments Off on Staples News – Be concerned, be informed!!!!! !